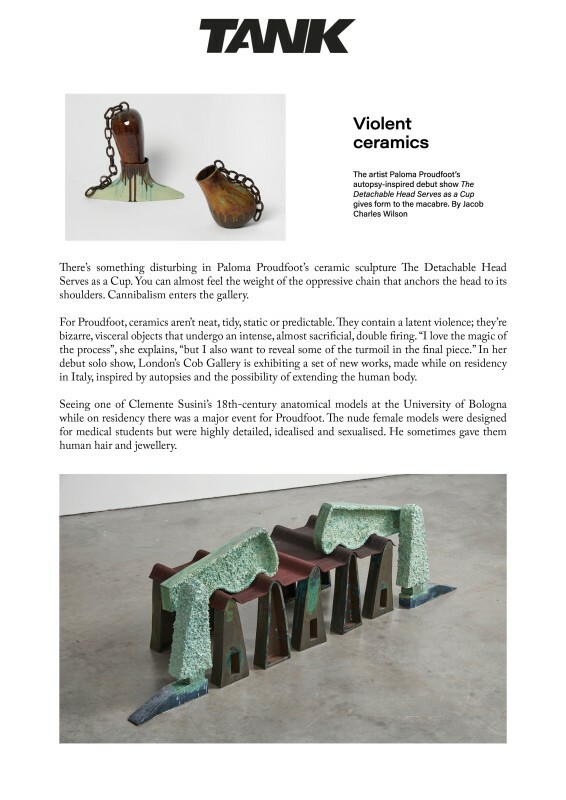 The artist Paloma Proudfoot’s autopsy-inspired debut show The Detachable Head Serves as a Cup gives form to the macabre. By Jacob Charles Wilson. There’s something disturbing in Paloma Proudfoot’s ceramic sculpture The Detachable Head Serves as a Cup. You can almost feel the weight of the oppressive chain that anchors the head to its shoulders. Cannibalism enters the gallery. For Proudfoot, ceramics aren’t neat, tidy, static or predictable. They contain a latent violence; they’re bizarre, visceral objects that undergo an intense, almost sacrificial, double firing. “I love the magic of the process”, she explains, “but I also want to reveal some of the turmoil in the final piece.” In her debut solo show, London’s Cob Gallery is exhibiting a set of new works, made while on residency in Italy, inspired by autopsies and the possibility of extending the human body.